* I have partnered with the American Dairy Association and Dairy Council to create this recipe. I have been compensated for my time commitment to work with their product, however my opinions are entirely my own and I have not been paid to publish positive comments. 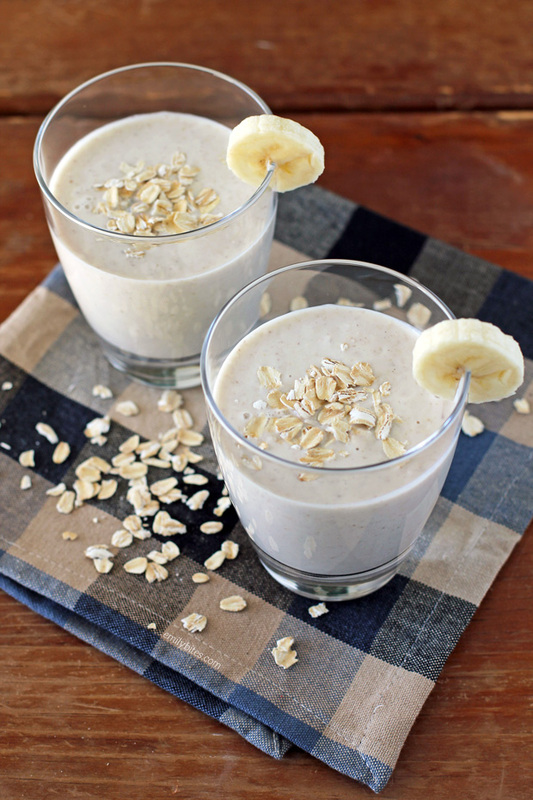 This Banana Bread Smoothie has all the delicious flavors of your favorite baked good, but in a cold, creamy beverage. 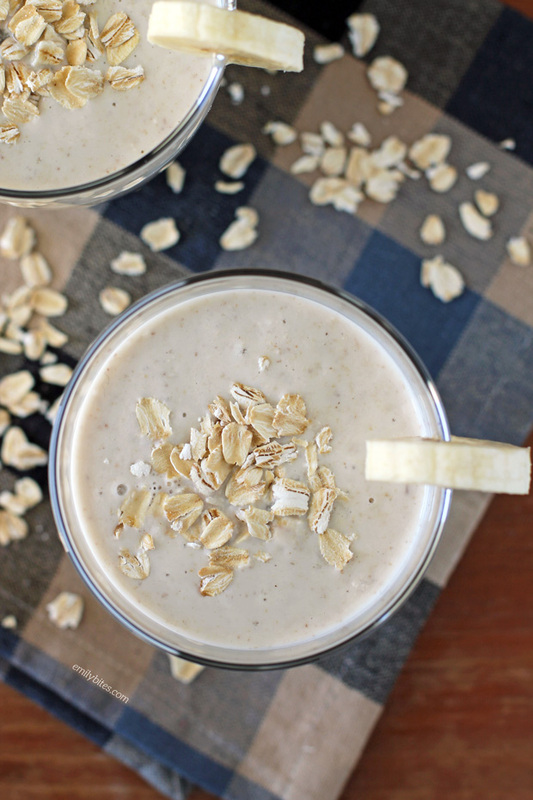 Banana, oats, vanilla Greek yogurt, pecans and milk – what’s not to love? It’s also packed with protein and carbohydrates to give you energy, making it perfect to start your morning or fuel a workout any time of day. Bananas are known to be ideal for pre or post workout snacks because they contain fast-acting carbohydrates for energy and potassium which aids in muscle function and helps to prevent cramping. Oats bring additional fiber to the mix and the milk and Greek yogurt are nutritional powerhouses supplying much-needed protein which your muscles need for growth and repair. Drink up and work out! Some of you may remember that back in June I worked with the American Dairy Association and Dairy Council* (ADADC) to bring you a tasty recipe for Strawberry Banana Frozen Yogurt Bites. When they contacted me earlier this month about working together again I was immediately on board, as I love all things dairy. I mean, milk, yogurt, CHEESE? Dairy is the best. Plus, while dairy is already packed with necessary nutrients (one serving of milk, cheese or yogurt provides 8 grams of high-quality protein and 9 essential nutrients), Greek yogurt typically has twice the amount of protein of regular yogurt so it’s a great way to add protein to recipes. More protein means a more filling, satisfying snack or meal! I grew up in the suburbs of Buffalo, NY and for a long part of my life I didn’t even realize how many amazing farms there were all around me. New York State has over 5,000 dairy farms across the state and is ranked 4th nationally in dairy farming – it’s not all just New York City, folks! Now I live more in the exurbs (it’s a thing, google it!) of Buffalo, so it’s almost impossible for me to be unaware of all the local farming since there are cows that live right down the street. Since so many other city or suburb-dwellers like me really know nothing about farming (but are interested in the farm-to-table process and love the food it brings us), Dairy Management Inc is producing a web series that pairs city folk with local farmers and has them spend a day in each other’s shoes. This particular episode (embedded below) features a boxing coach from Rochester, NY (not too far from where I live!) and a dairy farmer from about an hour away. Just press play below to watch them learn more about what it takes to live each other’s lives! 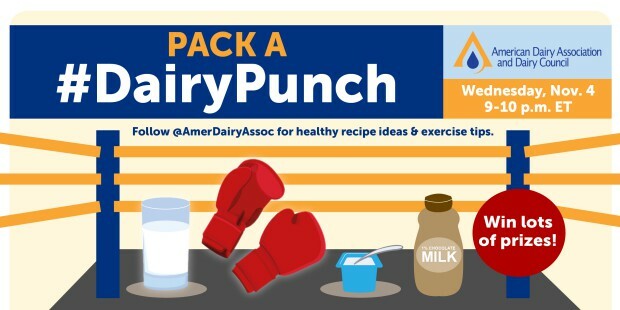 For more dairy facts, delicious recipes and nutrition tips from the farmer featured in the video above along with great New York food bloggers like Healthy Delicious, Running to the Kitchen, Wishes and Dishes and ME, join in for the ADADC’s “Pack a #DairyPunch” Twitter Party! The party with be Wednesday, November 4th from 9-10 PM and you can come to the party by following @AmerDairyAssoc on Twitter and using the hashtag #DairyPunch. Want more of my tasty lighter recipes using yogurt? Check out the ‘yogurt’ ingredient tag in my recipe indexfor ideas like Key Lime Cheesecake Cups, Spinach & Artichoke Dip, Blueberry Pancakes, Raspberry Peach Tea Smoothie, Zucchini Casserole and Chocolate Cherry Baked Oatmeal Singles. I agree ;). Thanks neighbor! Banana bread in a liquid form? Hell yeah! Genius!! Did not care for this as it remained gritty. Will try the classic “smoothie”. Try this…Soak everything overnight (especially if using old fashioned oats) Add the ice in the morning and blend. I found this to make a very smooth creamy shake. I also used frozen banana slices since I often have overripe ones not to go to waste and reduce ice. Just my experience making oatmeal smoothies! Thanks for another fun breakfast recipe. I just love your oatmeal single muffins! Where did you live? I did some time in cheektovegas, lol. Would this be lower in points if I used unsweetened almond milk?